China is strengthening its economy and expanding its influence worldwide at an unprecedented pace – thanks to the United States. “China has become rich beyond its dreams precisely because of US predominance in Asia and its military security umbrella, which has mostly kept the peace since 1975,” explains BBC journalist Humphrey Hawksley in Asian Waters. Yet China chafes at US involvement in Asia – a continent named by the Greeks, long admired as a source of wealth by explorers from other lands. Among the world’s oldest civilizations, more than 5000 years old, China is intent on developing its power and reputation, preventing another century of humiliation similar to 1839 to 1949 when other nations dominated its coastal cities. China pushes limits, taming its citizens and small neighboring states with a measured reward-punishment strategy that avoids outright conflict as described and practiced centuries ago by General T’ai Kung and later Sun Tzu, author of The Art of War. Respect is paramount for China. 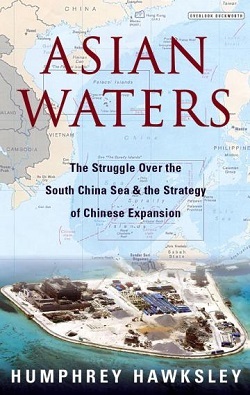 The book begins with China’s insistence on control over the South China Sea and a personal story of a Filipino fisherman attacked while fishing off Scarborough Shoal by the Chinese Coast Guard wielding a water cannon. The Philippines filed a complaint with the international court and won. But the United States discouraged Philippine President Rodrigo Duterte on going to war over a fishing reef, and the Philippines had little choice but to relinquish sovereign control. Capitulating to China’s demands, Duterte made a deal allowing Filipino fishermen to return to the Shoal. Neighboring countries hesitate to aggravate China, and the nation’s top policy adviser was blunt in 2010: “China is a big country and other countries are small countries, and that’s just a fact.” The United States, as ally and superpower, has its own priorities deviating from administration to administration, and so small countries have little choice but to comply, suffering their own humiliation. “No region is more vulnerable to China’s rise than Southeast Asia, which cannot challenge it militarily, needs its trade for its economies…,” Hawksley writes. “Southeast Asia does not want a throwback to the Cold War when each country was forced to choose between superpowers, although without clear thinking and straight talking, that is exactly what is unfolding now.” Countries accept the illusion of dignity, others playing the larger powers against each other. Asians, including Chinese, worry about the country’s vast size and steady march toward its version of progress that squashes dissent. Still, Asians cannot help but marvel at China’s efficiency, rapid economic growth and wealth. To his credit, Hawksley admits having erred by expressing doubt in the 1990s about China’s ability to modernize. Instead, modernization came at top speed, albeit with mistreatment of laborers and bullying of citizens, dangling money and infrastructure that also brought corruption and environmental degradation. A few decades is a brief period of time for countries with civilizations and relationships spanning thousands of years. Democracy is a powerful force with visionary and skilled leaders, but for polarized societies, the system delivers too many surprises and disappointments, wasting precious time. By contrast, China’s government moves with speed and reinforces united public opinion, and Hawksley narrows down the differences between democracy and the communist state to internet restrictions, press censorship and political controls. He concedes that the United States – once respected by allies for prioritizing liberal economic principles along with democracy, justice and human rights – has become less reliable in messaging and policy. The United States, viewing Asia as a growing trade power, announced a Pivot to Asia in 2011, an attempt that backfired. China, alarmed by the policy rollout, feared military implications and viewed the Pivot as an attempt at containment. Hawksley has a knack for delivering pointed arguments and parallels amid a concise array of key historical events. The book occasionally drifts off-topic at times, as in two chapters on India with analysis of poverty, labor fraud as well as nuclear rivalry with Pakistan. Yet he makes a point: Beijing slowly encircles India – no match for China in terms of economic growth, discipline or governance – soon to make the country another subordinate of Beijing. Over-reach in an era of growing populations and limited resources is treacherous for countries, and Hawksley argues that countries must reduce poverty, political divisions, corruption, outdated infrastructure, human rights abuses and other challenges before reaching out to other countries. Planning and flexibility are crucial, helping even with the unexpected, events like Japan’s 1941 attack on Pearl Harbor in Hawaii. The possibilities for such a black swan event have only expanded, including anything from containing regime collapse in North Korea to surviving shutdown of energy grids, and resolution of most would require multilateral cooperation. “Today China is determined to become the regional power and the United States is equally determined to retain its position of predominance,” Hawksley writes. Nuclear weapons instill fear but do not provide prosperity or security. Cyberwarfare, described as a great equalizer by Hawksley, can be waged by individuals, while space prowess, artificial intelligence and other emerging technologies contribute to containment and control. Emphasizing the tradition of respect for one’s rivals in Asian culture, Hawksley offers Taiwan as a model for small countries with its focus on education, technological advancement and soft power that includes establishing a maritime research center rather than a military base on Dongsha Island in the South China Sea. Hawksley reiterates Sun Zhu’s observation that wars can be won without a shot being fired. Overhaul of the global order and recognizing China’s economy and contributions could prevent conflict. Needless delays in reforming the World Bank, the International Monetary Fund or the UN Security Council only prompted China to proceed with its rival organizations including the Belt and Road Initiative and the Asia Investment and Infrastructure Bank. China could do its part, too, by extending respect to neighbors: no longer supporting insurgencies that weaken neighbors; de-escalating conflicts in the South and East China seas; and discarding false dilemmas such as security demands social controls, escape from a humiliating past requires humiliation of others, or China’s rise means the West’s descent. China can run roughshod over maritime borders because many South China Sea islands are remote and uninhabited. To be regarded as a global force, China must find a peaceful, pragmatic way to end disputes over Asian waters – and demonstrate that the transitions associated with its rise will be painless. Susan Froetschel is the editor of YaleGlobal Online and the author of five mystery novels, including Fear of Beauty and Allure of Deceit, set in Afghanistan. As China heads towards being the world's largest economy - it is already by one measure - it is natural that it would want to control or have influence over areas adjacent to itself. However, this can be done in a way that accepts or rejects international law. China has chosen to reject law - "we are big and you are small." Why? One answer is that it can. Another may be that it has tens of millions of excess males of marriageable age who cannot get married. I have yet to see research if they constitute part of the ultra-nationalist online community that constantly harps on periods of humiliation. This group may strengthen aggressive factions within the military and Party, giving people "national pride" rather than freedom. This works against China's attempts at soft power and a peaceful rise and may even give rise to a coalition against it. Nobody likes a bully. As the US will find out soon, it helps to have real friends, rather than subservient states that will turn on you.Who are China's friends?